The Exiles was filmed entirely in and around the Bunker Hill neighborhood of late 1950s Los Angeles. So why include it in a San Francisco movie location blog? Well, two reasons. First, CitySleuth found out the hard way after scouring the city a number of times for locations featured in San Francisco movies that they had been filmed in Bunker Hill. As it turns out, L.A.'s Bunker Hill and S.F. 's Telegraph Hill had much in common with their turn-of-the-century wooden buildings, steps and steep streets. And second, because in researching these sites over the years CitySleuth has come to know and love the old Bunker Hill so well despite never having been there and despite its total erasure by the end of the 1960s. So imagine his delight in coming across this wonderfully restored movie and witnessing the preservation of sorts of so many locations from a bygone era. Such nostalgia, ergo it cried out to be shared. Woman On The Run (1950) ... The police arrive to investigate a murder at the top of a steep flight of steps. This was filmed on Court Hill above the Hill Street tunnel in Los Angeles' Bunker Hill neighborhood. 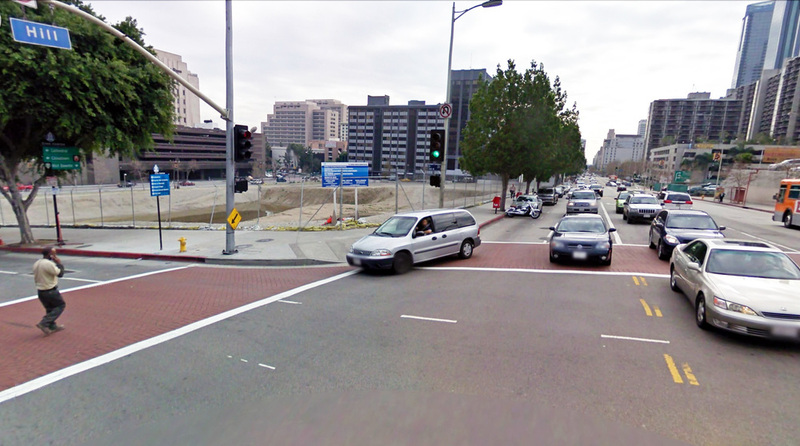 The building to the left at the bottom of the hill is the Bunker Hill Central Police Station at 1st Street and at right, receding south into the distance, is Hill Street and downtown Los Angeles. ... and Now, the steps and tunnel are gone and the hill flattened - here's Hill Street looking south from 1st Street today. The police station on the corner is gone too but worse, to the dismay of many, the very soul of the old neighborhood has been ripped out. Sudden Fear (1952) ... An enraged Jack Palance aims his car at his wife Joan Crawford (who turns out instead to be his lover Gloria Grahame). Again, this is in Bunker Hill where she is running past the Mission Apartments at the corner of 2nd and Olive. 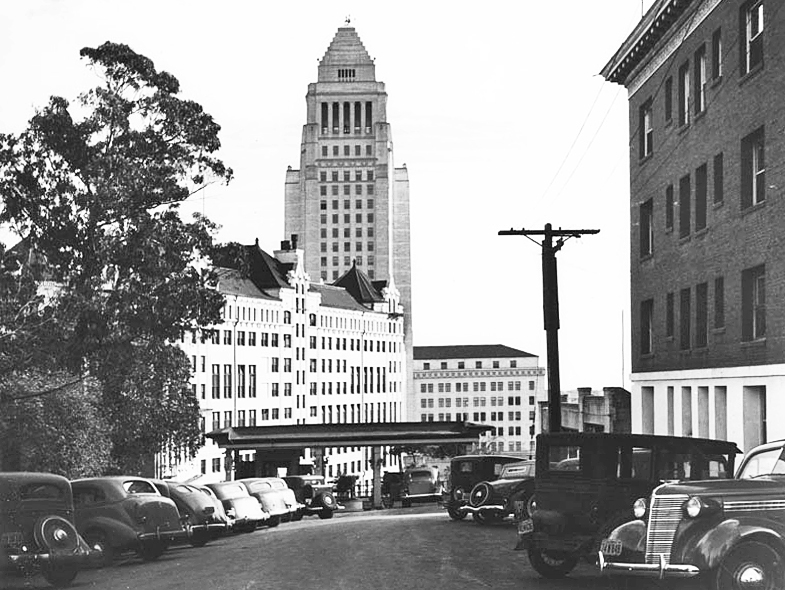 ... in 1948 ... here's the same building in this vintage photo which also captures the balustrade above the 2nd Street tunnel and, below it, the Hotel Astor on the corner of Hill Street. ... and Now, again unrecognizable. No thanks to neighborhood cleansing those wonderfully evocative old places now seem like figments of the imagination. The Sniper (1952) ... Arthur Franz is seen walking on a street with a distinctive building behind him. This is Court Street on top of Court Hill in the Bunker Hill neighborhood and to get there he has just climbed the steep Court Flight steps leading up from Broadway between 1st and Temple. The building behind him across Broadway is the old Hall Of Records. ... c. 1940 ... this vintage photo shows a wider view looking down the same stretch of Court Street revealing more of the Hall Of Justice with City Hall behind it. The structure at the end of the street was the upper terminus of the Court Flight railway, still operational at that time but closed down and demolished by the time The Sniper was filmed. ... and Now, Court Street, and indeed the entire Court Hill, has been eradicated to make way for this parking lot. 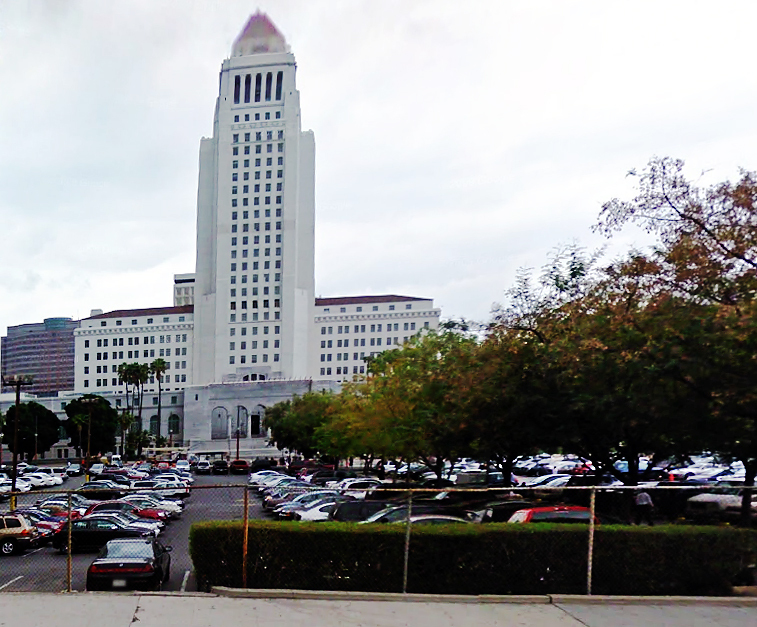 City Hall is in the background but the old Hall of Records, which used to be at the left of this photo, was torn down in 1979.